The Byron C. Cohen Gallery & HomeContained, Debbie Glassberg’s PreFab Projects, 2010. The Movable Salon Exhibition took place at the Byron C. Cohen Gallery, KC,MO. It also had an experimental satellite install at Pre-Fab: HomeConained. Both installations highlight the transitory nature of mediated lenticular prints with large, expansive hand drawings. It is a participatory concept contingent on the changing nature of audience, locale and media. It engages the vernacular “place” of wilderness, to domescile, to the ubiquitous world of optics and technology. Blue de Esta, oil on canvas, 48x48", 2010. Private Collection. 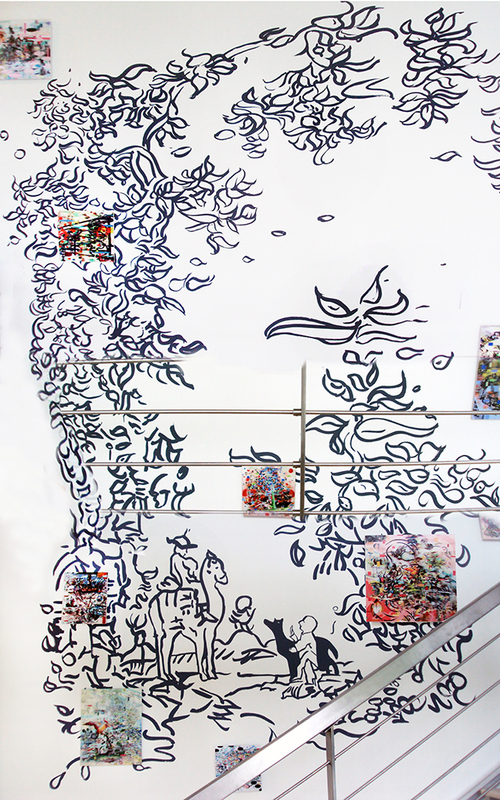 Oracle, In Situ, Sumi ink on wall with 3D Lenticular prints, dimensions vary, 2010. Emperor Smoke, 3D lenticular Print on SIntra, 24x24", 2010. Cherry Neutra, 3D lenticular Print, 24x24"
Cherry Stairs III, 3D lenticular print, 24x24", 2010. Cherry house, 3D lenticular print on sintra, 24x24", 2012. Empire, 3D lenticular wallpaper. Private collection. Interior Neutra, oil on canvas, 48x60", 2009-11. The Elrod House, gouache, ink drawing on pigment print, 59 x 52 3/4” inches, 2010. Neutra Palm Springs, oil on canvas, 24x24", 2010.